I recently listened to the DnD podcast from Wizards of the Coast, which was released around the same time as the dnd Next playtest (around 24 May) was made available online to the public. They have a ton of work to do, but are loving it. The game has been in development for over a year. That probably means in a closed/secret playtest for all that time. Wizards are looking forward to the community feedback, and anticipating a lot of positive reaction from their work. I’m dubious about this, and think that the real story is that they are going forward with a positive and strong presence, as anything else would be counterproductive. The devs would have to expect push back from parts of the community. The playtest is a staged release of content and rules, where month by month new material will be released. This so that feedback can be elicited in a series of smaller segments, rather than a huge chunk of rules. As a primer on what feedback the devs expect it was actually useful to hear. A cynical person might say this was standard marketing fluff, but as I am an equally cynical person I’d counter that to say that Wizards could have done far less in this process. The energy in rhetoric alone has been substantial, and at some point it is the same amount of work to actually listen to feedback as appear to do so. The point was made about giving descriptive feedback in terms of good and bad features/aspects, but also that they wish the reviewers to be unforgiving and straight to the point in giving negative feedback. The speakers made a point to ask for bad feedback. That takes some guts. What was most valuable in the podcast was point one – knowing that they are going to come out of the gate all guns blazing. That is the dedication they need for Next to get up as a product. I think it would be a shame for RPGs if DnD-5e was a whimper, and would impact the hobbie substantially because of how much of a hook DnD is for rpgs in general. Dnd was the gateway game which started me on roleplaying, and despite years of effort, new systems, and all sorts of considerations – it still has a place, and may still provide a source of entertainment. One of the podcasters (I can’t recall which now) really did seem honest in their enthusiasm for the product. Bravo. I still stand by the idea that dnd should be given a fair play, and also expect it to not be my style of game. Yes, that is a healthy contradiction, and a stance which could change given play. The introduction of “backgrounds” and “side features” into the character generation is a first for dnd, and something which is a huge positive. If they added a sample of small negative quirks then they’re really getting into a style of game that I could accept. I’m watching with reserved interest. If DnD Next was branded as a new game, would it sell better? I had a thought about the debate on DnD Next, and how the version wars are puttering along. What would happen if the same mechanic ruleset was released by somebody else? Is it disliked because of a fear of change, or an inclination of disinterest? Pathfinder took a variation and made it popular. Could be that they fixed a lot of frustration, and did so without the yoke of owning the product. The same action by the owner might not have been as popular when Pathfinder was released. We now see Pathfinder further tweaking their rules, and getting a mixed bag of acceptance feedback. Coincidence? DnD 4e went to a new place mechanically with the highly tactical play, and I think it would have been hailed as an innovation if it wasn’t meant to replace older versions of the dnd brand. 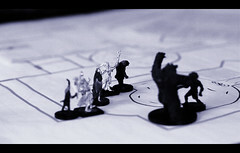 Meaning as a new game it was very clever and innovative, as dnd a segment of the community hated it. The same things feels true about 5e – that a third party could release the “Next” rule-set as an indie mod, and probably get a better reaction than dnd’s publishers. Why? Less extremes to worry about. You’d get everyone who wants to test it happily trying, and all the core rules fans ignoring it. The edition war would not start because it would not be an official edition. If you hold that position as plausible, then it is kind of sad. A new rule-set should be evaluated without that prejudice. Like it or hate it, it should be given the opportunity to be played properly. An rpg is not removing the rulebooks from our shelves, so that if an old edition is a favourite, then it can continue to be played. 10 rpgs you’ve heard of…ahem! GeekoSystem has a post which claims to show 10 RPGs You’ve Never Heard Of. I call rubbish – in the list is Paranoia, RuneQuest, StarWars, Tunnells & Trolls, and yes some others that I’d not encountered. Sheesh, in that list are some old good game which were very popular a while ago, but hardly not heard of. Now to the author’s credit he did say the readers would have heard of some, and not to freak out; but it felt like a list with very prominent titles on it. Paranoia has had many additions, and I’d say more people have played RuneQuest than the recent version of Warhammer Fantasy (which tanked). GeekoSystem also included Pokemon RPG list; double sheesh. Yep I’ll give you that, but its bloody pokemon. Create a RPG based upon Barbie Pony Ride Adventure in Happy Land! and it won’t be well known in the RPG community either, or perhaps it will as a joke but the sales won’t be there. The typical RPG player is looking for escapism and entertainment, with a health slash of violence and as much cool as possible. It’s why we saw Vampire pick-up so much ground many years ago. And as a stereotype gamers are not dumb, and are often poor – so will be conservative in purchases. Now Don’t Rest Your Head is spot on in terms of indie RPG however, and I’m glad to discover USR by reading the article. Consider too that some RPGs remain niche markets, like Ars Magica which I banter on about a lot, and it probably has less players than Pokemon. All hail friend-computer. Destroy all commie mutant traitor scum. Are you happy citizen? The ruleset has always been trivial when compared to the influence the playstyle the team brings to the table has on gameplay. A bunch of tabletop war-gamers could railroad 1st ed just as well as a bunch of roleplayers could chatter happily in 4th ed. 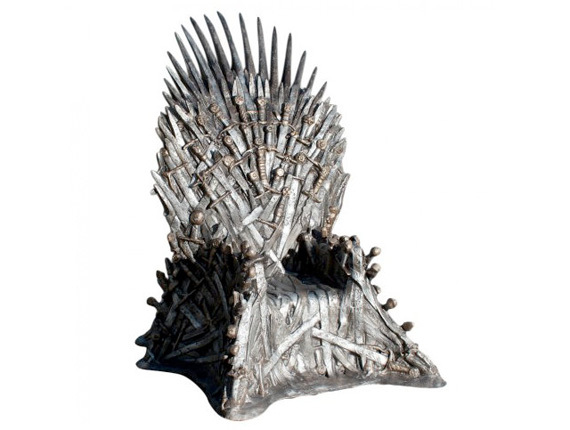 As a Game of Thrones fan, I’m both excited and appalled that we could now buy the Iron Throne. I mean it can’t be purchased with gold alone, can it? Ask a Lanister I guess. Rather than looking at stenographic illusions or encryption techniques to protect highly valuable books, transformation of the physical texts is a solutions which offers protection against mishap and also very effective security. The approach also has the advantage of being based firmly within the existing spell guidelines. This spell temporarily transforms a book into a small very hard object, such as a gem or piece of metal. The form of the object is chosen by the caster. This facilitates concealing and carrying the text in a more convenient manner.